This is a beautiful course that is a real test of your ability. One of my good friends worked in the pro shop of The Majors, thus I got to play a few rounds here with him. He absolutely loved the golf course, but it wore me out every time I played it. Maybe it was because he always made me play from the tips, which is 7300 yards! The rough here is what kills you. In Florida, there are about nineteen thousand different kind of weeds and grasses, and here at The Majors, they all grow together to form this thicket of nastiness that is hard to walk in, let alone hit your golf ball out of. What's more, a lot of the tee shots require you to carry your ball over this tropical golf ball purgatory. Once you find your way to the green, make sure you know how to read the grain. "Grain?" you ask. I'm with you... I thought grain was something I was supposed to be eating to stay regular. 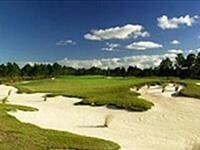 In Florida, it's the way the grass grows, and knowing it is the key to not three-putting or even four-putting. I'm being a little rough on the Majors (no pun intended.) This is a beautiful golf course that is maintained like a country club course. There is a lot of wildlife, including alligators and many types of waterfowl. And finally, they have great weekly specials. So go test your skill against this difficult course -- just make sure you bring along plenty of golf balls. Click here to find details and tee times at GolfNow.com.